Commemorating 50 years at Firebird, the 2017 Motorsports Annual is a publication looking back at the history of the raceway. 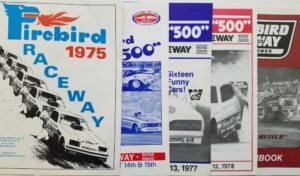 Since 1975, a souvenir program has been produced for the Firebird racing season. This year’s Annual is loaded with amazing photography and written commentary about the track’s first five decades. 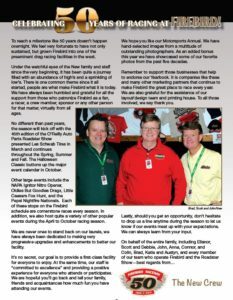 We are grateful to all the hard work put forth by a number of people. They include the design team at ARC Document Solutions and Bozman Design Studios. Our official print house at Caxton Printing in Caldwell. And especially all the photographers who gave permission to share and showcase their outstanding work. The covers of Firebird’s first four programs in 1975, 76, 77 and 78. The 132-page book is chock full of photos that have never been shared previously, many from the earliest of days at Firebird. Looking back in time, the first few programs were all of 16 pages in size. They principally focused on the Nigthfire 500. For quite a span of time, the cover was two colors and the inside pages were all black `n white. In fact, the first few (3) programs were created, printed and distributed via a mass marketing firm in the midwest who worked off ad sales to produce the rather small saddle-stitched programs. For those of you who still have your early programs, it’s still fun looking back at those vintage covers. The first four program covers featured Don Prudhomme (cover 1975), Tom McEwen, Jerry Ruth (1976), Raymond Beadle’s “Blue Max” (1777), and Gordie Bonin (1978). And through the years, the cover photography features many of the who’s who of the sport right up to present time. 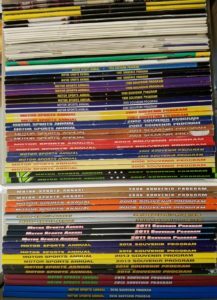 Fortunately enough, through the years, the annuals have grown in page count and quality. Today, the books are full-color from front to back. The books are also perfect bound (square binding edge) at the printer. Forty-two programs have been produced over the years dating back to 1975.